announced Google Shopping, a new way for people to find and research products, and discover where to buy those products online or nearby. Google Shopping helps people turn their shopping intentions into actions quickly and easily, and then connect directly with merchants to make purchases. We've been pleased by the rapid adoption of Google Shopping in the retail community; tens of thousands of merchants, including many marketplaces, have come on board and are participating in Google Shopping via the new model, based on Product Listing Ads (PLAs). Overall, this represents inventory from over one hundred thousand sellers. 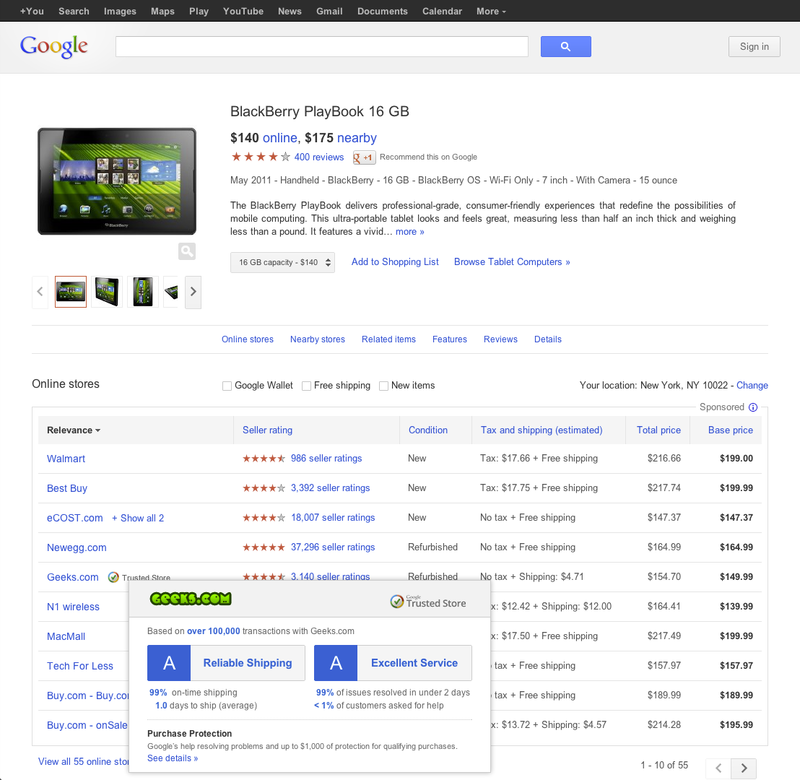 Google Trusted Stores annotations are appearing on product pages within Google Shopping, providing participating merchants with greater ability to attract new customers and helping shoppers to make more informed shopping decisions. For merchants that are not familiar with Adwords, we have created a simplified sign-up flow in Merchant Center to make participation easier. AdWords Editor updates are reducing the amount of time it takes to optimize a PLA campaign -- from hours to minutes, in many cases. Campaign Tracking URL templates have decreased the number of steps required to set up tracking in AdWords and are making the process easier for merchants. Of course, it’s not too late for merchants to get on board and optimize their campaigns prior to the upcoming holiday shopping season. We’ve recorded a series of Hangouts on Air to help small and mid-sized businesses transition to Google Shopping, and have made some Google Shopping best practices available here. We’ve seen some early success stories from a variety of retailers, demonstrating how Google Shopping has helped them to connect with consumers, drive clicks to their websites and improve conversion rates. Highlights from some mid-sized merchants are listed below; you can find the full text of all these success stories following each description. Adorama, one of America’s largest photo retailers and mail-order suppliers, saw their click-through rate (CTR) jump by 176 percent and their conversion rate rise by 100 percent in June 2012, as compared to a year earlier; a similar year-over increase also occurred in July 2012. The full success story can be found here. Campmor, a recreational equipment retailer, saw sales increase 10x between January 1 and the present, using PLAs and Google Shopping. The full success story can be found here. Empire Covers, an online retailer offering protective covering for cars, trucks, boats, RVs, and motorcycles, along with accessories for pet travel and outdoor living, saw their cost-per-acquisition (CPA) decline by 36 percent between April and August 2012. Additionally, CPCs dropped by 11 percent from July to August 2012. The full success story text can be found here, and a video with more details here. Plow & Hearth, a leading retailer of products for the home, hearth, yard, and garden that includes all of its products for all of its brands in PLAs on Google Shopping, saw a number of dramatic results: unique site visits increased by 129 percent, pages per visit increased by 6.3 percent and average visit duration increased by 14.7 percent, while their bounce rate dropped by 9.8 percent. The full success story can be found here. ToolKing.com, an Internet Retailer 500 company offering tools, hardware, home-improvement items, outdoor goods, and more across multiple e-commerce channels, lists all its products in Google Shopping via PLAs. Since signing up for PLAs, ToolKing.com’s traffic and conversion rates have risen by more than 50 percent, average order value is up by nearly 15 percent and the sale of thousands of items it once considered “dead” have been reinvigorated. The full success story text can be found here and you can watch a video with more details here. TravelSmith Outfitters, an outfitting resource for savvy travelers, used the expertise of Mercent to implement PLAs. Since then, product sales originating from PLAs and Google Shopping have increased by 200 percent. They have also increased consumer traffic by approximately 10 percent and have seen orders go up by 35 percent, with more than a 26 percent increase in sales conversions. The full success story can be found here. We look forward to sharing more with you over the coming months -- from new merchant tools that provide more control and flexibility, to new features that will make holiday shopping easier and more fun for consumers. 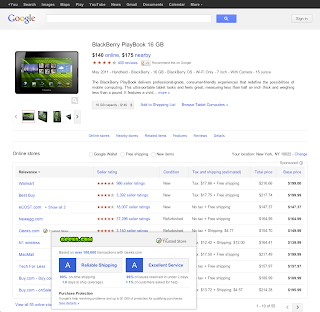 We’re also in the process of planning our 2013 roll-out of Google Shopping in Europe, Asia and Latin America. We’ll have more to share in the next few weeks, so stay tuned. In May, we announced Google Shopping, a new way for people to find and research products, and discover where to buy those products online or nearby. Google Shopping helps people turn their shopping intentions into actions quickly and easily, and then connect directly with merchants to make purchases.